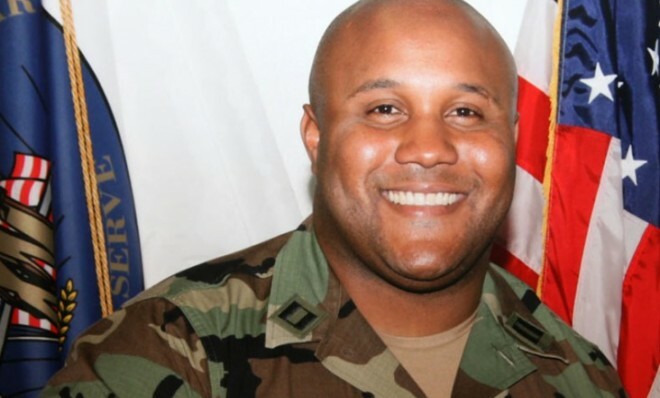 Christopher Dorner has become a hot-button topic as of late. And I feel strongly enough about the topic to emerge from my hiatus on writing. Forgive my absence, I’ve had little free time as of late. Alleged cop-killer Christopher Dorner was supposedly chased into a cabin, where he allegedly exchanged fire with officers and killed another. I use the term alleged because that’s what you’re supposed to do until one is proven guilty in a court of law. Christopher Dorner will not have his day in court. As you can hear in this audio of the police scanners, they appear to have set fire to the cabin Dorner was supposedly occupying. Notice they discuss the “4 side” (assuming back of the cabin). They discuss watching for him to exit this side, and “remember your backdrop.” Clearly they intended to shoot if he emerged. 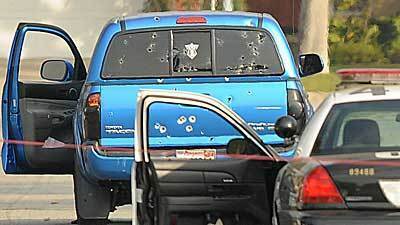 Notice how police responded to a vehicle that they believed matched the description of Dorner’s (pictured at right). Numerous bullet holes riddle the back of the truck. Notice how they all come from the rear. This makes it apparent that the officers did not know who they were firing at (did not make positive identification). Also, notice the bullet holes on the passenger side. This vehicle was occupied by two Hispanic ladies. Why would they be firing at the passenger if their hunt was for a single person? Whatever happened to the legal maxim “innocent until proven guilty”? In Mr. Dorner’s case, the police forces involved have played the part of judge, jury, and executioner. Yes, the audio above indicates that police heard a single gunshot from inside the cabin when the fire began (which they set). If that was indeed Dorner inside the cabin, he took his own life. But if he’d seen the news reports of police shooting up two separate vehicles on the mere suspicion that they were his, he knew full well he wasn’t walking out of that cabin alive. He had two real choices, kill himself, or burn to death. Is this the America we want? Where police can execute you on accusations? Where you can be indefinitely detained for being labeled a terrorist (which Dorner had been by the LAPD)? Where you can be killed by drone strike without ever having a shred of evidence presented against you in a court of law? If Dorner killed these people, then let the evidence be presented before a jury. Let testimony be heard in a court. And if found guilty, punish him. Wow. I haven’t really been following the story about Dorner (been too busy to read the news! ), but this is horrible. Any idea what happened to the 2 ladies in the blue pickup? I’m assuming/hoping they weren’t in the pickup at the time of the shooting? One of the ladies is still in ICU. The other was (amazingly) not struck by a bullet.